Occasionally we find something so special, so gobsmackingly brilliant and pleasurable we just can’t keep it quiet. CERU is one of these places. Founders Barry and Patricia Hilton have travelled extensively throughout the eastern Mediterranean and, together with a small team of brilliant culinary whizz kids, have thoughtfully and inventively created a subtle contemporary menu loosely based on ancient recipes. Turkey, Lebanon, Syria and Israel all lend a hand to create a very up-to-the-minute, unfussy sharing menu. We’ve zoomed around London over the past few years chasing the restaurant at its various successful pop-ups in Rathbone Place and Cannon Street but it is now time to celebrate as CERU has found a permanent home on Bute Street, in trendy South Kensington. The concept is fairly straightforward; informal café style sharing menus served by a tip-top team. The menu is devised for sharing, divided up into four parts: dips & salads, seafood, meat & poultry and vegetarian. First up, two cucumber martinis – one of CERU’s signature cocktails. Cooling, fresh and with only a hint of gin to taste. We were practically forcedfed another two. How terrible! A concise but sophisticated wine list whereby, super-helpfully, all are offered in either by the glass or a 500ml carafe. Having spent many a summer on the Turkish Riviera, my expectation for the Chardonnay from Kayra Wineries was high. A splendid deep and oaky example, whilst leaving a pleasant vanilla-butter taste. Barry helpfully suggested a few of his favourite appetizers to begin proceedings. The Pancar dip, roasted beetroot, yoghurt, garlic, crushed pistachio, arrived looking enticing; a bright pink swirl sprinkled with nuts. Scrumptious, uber-healthy and vibrant, with just a hint of sweetness. A Crisp apple, mint and walnut salad, served with pea shoots, roasted pine nuts and green chilli, really hit the spot, the mint not overpowering, the pine nuts mellowing down the bitter fruit. Next up, a generous Fillet of oven-baked sea bream is presented, wrapped, poking out of a parchment case. Creamy, bursting with flavour, the oregano and fresh chilli offering a gentle kick. The Shish taouk, chicken breast rubbed in lemon and paprika, is as expected; succulent and vibrant, accompanied by a cooling herby yoghurt. Other meat dishes which looked equally enticing were the Persian kafta (aromatic spiced beef patties) and Rose-scented lamb kebab skewers. 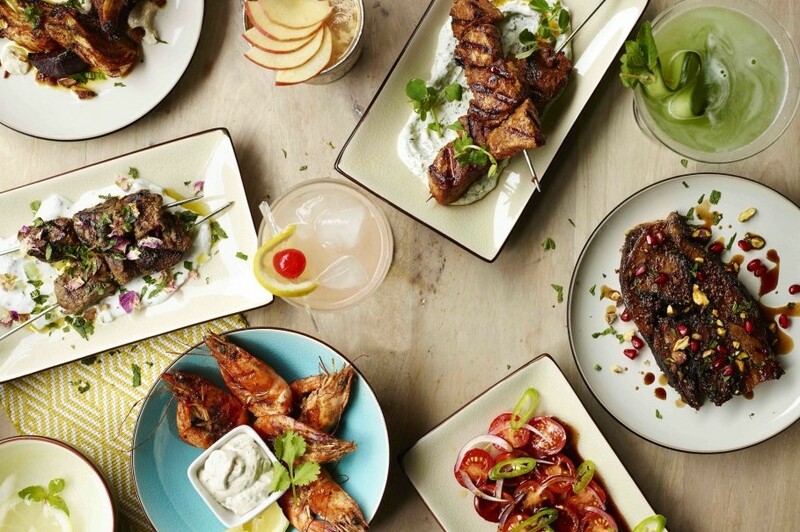 Health-conscious meat dodgers, you are also in for a treat as CERU offers four hearty inclusions such as the Fried halloumi and grilled red peppers, and Zucchini and feta fritters. My companion had spotted something interesting served at a nearby table, which turned out to be a cute Dark chocolate mousse injected with sour cherry and crunchy pistachio nuts, a coupling I have not encountered before but one that needs to be wolfed back by cocoa lovers everywhere. Rich, deep, insanely scrumptious. This place should be at the top of your list for dining out in 2017. We love CERU.